Metro Walk in Rohini, Delhi gives an impression of a vibrant retail high street. Located opposite Rithala Metro station, and easy connectivity through Metro Rail and Outer & Inner Ring Road, this unfilled destination fulfills a longstanding need for a great entertainment facility in Delhi. Designed and conceptualized by a world class architect – ‘Forrec’ form Canada, Metro Walk is spread over an area of 8 acres, and emphasizes on entertainment and convenience. 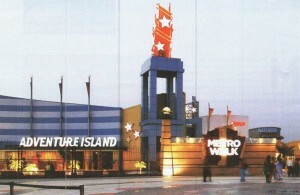 Metro Walk boasts of over 100 brands which offer a perfect mix of Shopping, Dining and Entertainment experience. The ‘Walk in Foutains’ at the Grand Court is one of its kind in the country, while the shopping area consists of a Cloud court, Grand court and a Circus Area that are themed accordingly for events and promotions. Themed signages and extensive interiors in vibrant colours make it the most happening destination for the youth to hang out at. The Metro Walk is designed in four different sections, which have unique features along with a large food court. Its anchor stores like Pantaloons, e-zone and McDonald’s are real crowd pullers and ensure that the place remains rocking all year round. Its restaurants by the beautiful and romantic lagoon and overseeing Adventure Island offer breathtaking views while one feasts on mouth-watering delights. This 2-lakh sq.ft of retail environment is 5 minutes walking distance from the nearest Metro Station and 10 minutes drive away to National Highway.